Just when you were calming down from statues you inexplicably are unable to buy, and bizarre furry action figures that are exclusive to specific locations along comes another one to make you scream in frustration and head to eBay. 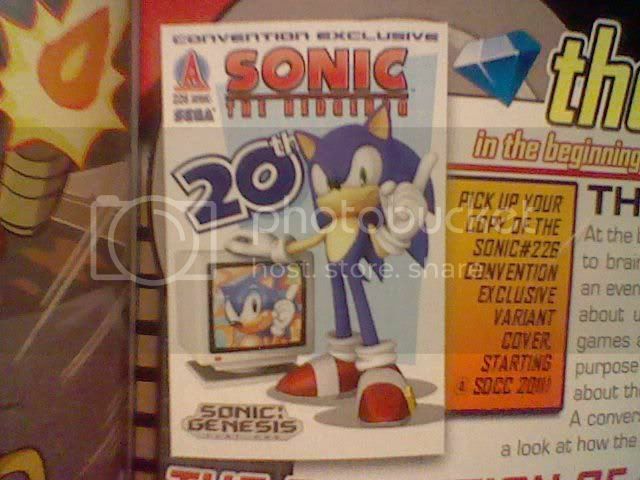 If you check issue #30 of Sonic Universe you will find that Sonic The Hedgehog #226 is to receive a special “Convention Edition” with a 20th anniversary artwork cover variant specifically for the San Diego Comic Con. Somehow this one, to my knowledge, has snuck under the radar – though admittedly I can’t keep up with the Sonic news much nowadays myself – so if it is old news apologies.